A while back I did some 3D printable token for the indigogo campaign of Robobrrd. 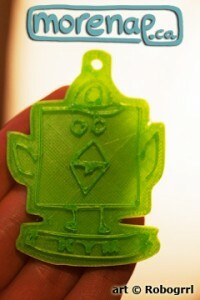 You can find these on my Thingiverse page (Surf, Hat and Mail ) and personalize the banner with your name. Tokens can be used commonly as keychain or backpack tag, thanks to the top hole that allows them to be hooked wherever you like! More recently, I did the emblem of Chirault‘s artist Varethane, for her ink-press stamp decorations. These are about 4 inches big. Feel free to ask for your personalized token or effigy! Varethane effigy, Positive and Negative print.